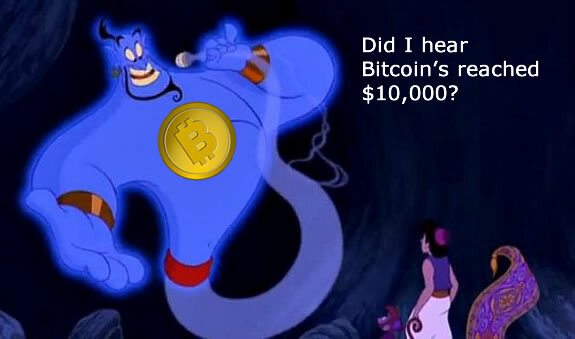 With the 10K Bitcoin Milestone ahead who would have thought that in a few short years Bitcoin would reach $10,000 dollars USD mark? At BTC World News, did you know that we began reporting on Bitcoin when it was only a few dollars? Yes, it’s true and we’re still here today. Just over 4 years ago on November 11, 2013, we published an article entitled, “Bitcoin – The World Working Together“. The article focused on a guesstimation of where Bitcoin prices would go. Yes, this means 4-times the total world’s wealth, combined all together. If the entire world has 3 trillion, then Bitcoin will be worth 4 times that. Considering the average price of Bitcoin in November 2013 ranged from $350.00 and then later surged to over $1000.00, the simple math continues to support our original guesstimation. Since November 2013, Bitcoin has increased 28X in price. Considering the next 4-years, this implies that for each year ahead, Bitcoin’s value will increase 7.1X. By late 2018, the value of Bitcoin is estimated to surge above $71,428.00. Are you asking yourself, should I invest? If so, then the short answer is YES. However, with this said, here are a few Do’s and Don’ts to consider moving forward. Begin educating yourself on Bitcoin and this type of currency. This means learning not only what Bitcoin is, but how it’s structured, how it’s managed and similar. We’re not suggesting you should become a BTC Guru, just be mindful of what you have and how to protect it. This is no different than you would your checking account of your credit cards. Start a discussion and share what you know with your family and friends. Don’t Take all these financial analyst’s and their opinions with a grain of salt. As a good portion are FUD peddlers are doomsday type mentalities, its a few direct Google searches on the topic of Bitcoin. Why? The answer is simple, their specialty is traditional finances whereas Bitcoin is a completely new generation of financial freedom. Don’t fall prey to scammers who state they can turn you into a Bitcoin millionaire overnight. In conclusion, keep the rally going and celebrate the 10K Bitcoin Milestone.